Here’s a unique one; a “self help” book evoking Houdini. It has something about thinking “inside the box” yadda, yadda...whatever, it has Houdini on the cover so they got my ten bucks! Transform the shackles of conformity into the tools for generating amazing, unconventional results. Houdini performed his greatest tricks within the confines of a box. Now one of the advertising industry's brightest and most innovative stars shows you how to do likewise: to use the power of thinking inside the box to unleash the power of innate creativity. Who hasn't been extremely creative when boxed into an exceedingly tight deadline or budget? 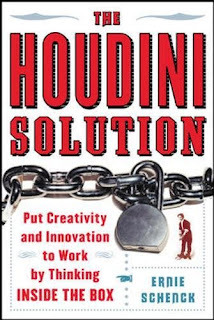 The Houdini Solution introduces a radical theory of how to generate more focused and powerful ideas by accepting, and even thriving on, constraints instead of being controlled by them. Filled with inspiring anecdotes and intriguing exercises that will yield surprising results, this book will spur you on to unleash the full power of your creativity, work magic in the workplace, and succeed beyond your wildest dreams. 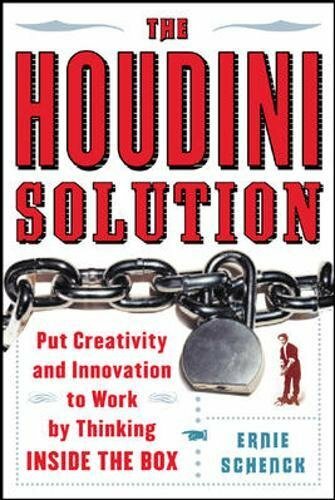 Purchase The Houdini Solution from Amazon.com. Purchase Anatomy of Keys from Amazon.com. 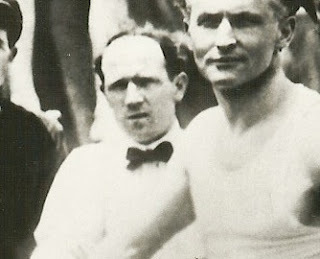 One of my favorite shows on PBS, the History Detectives, kicked off its new season with an investigation into Houdini. While the “discovery” that Houdini exposed spiritualists as part of his show during his final years was hardly a revelation to Houdini buffs, the segment was very well done and entertaining. It's also a poster that I've never seen. 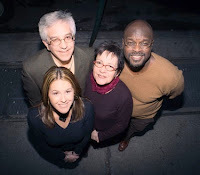 Now the official website is offering several follow-up goodies, like a list of Houdini reading material, a quiz, the interview with Lance Burton in Realplayer, and a full transcript of the segment. So if you missed out, hop on over to the Houdini episode section of the official website and download away. Dave Dorsett of Douglas-Wayne Illusioneering (who made the beautiful Water Torture Cell reproductions) is currently researching a project on Houdini’s chief assistant and mechanic, Jim Collins. 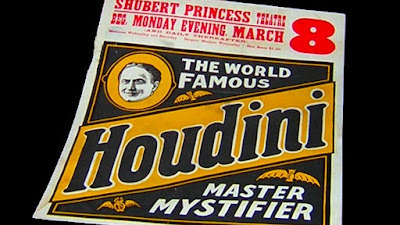 Dave has uncovered some remarkable new information, but he asks your help in finding out even more about the man behind so many of Houdini’s mysteries. Dave has discovered Collins ended his life in Philadelphia, is buried in New York and his widow might have moved there. If you know of anybody in either of those areas who might be of assistance or if you know of or have access to information or correspondence from, to, or concerning Collins, please email Dave via his website. Dave would be very grateful, as would most Houdini enthusiasts who would certainly love to hear the full story of this elusive figure.